This sketch is a map of feelings and emotions the human is experiencing in life. It depicts complex features and symbolic elements which highlight them. 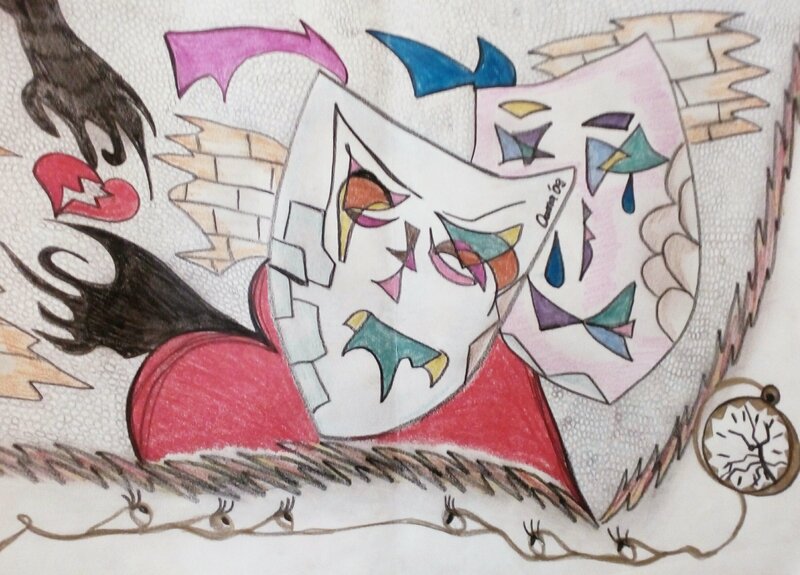 The heart carries different complex feelings during life represented by the two masks placed in front. They also have a protective characteristic. They place before the heart as a shell against the outside. However they are not strong enough for the wondering heart because life brings different factors which are still able to create an unbalance. The stone walls depicted are representing an impediment for the heart to reach its purpose. The time factor is also in the picture. It has a first role of introducing pressure to the heart. The impression that it is not enough time for the heart to reach its purpose. The small eyes chained at the bottom of the sketch are the other people. The others who watch the heart’s struggle. There are not too many of these eyes which will support the heart in its pursuit. The majority will just watch from the outside and judge. This sketch does not have a happy ending for the heart. It will end up torn apart and unable to reach its purpose. However, time has also a second regenerative role to help the heart heal and re-build its purpose.